The "Flowmaster@ Sound" is the true tone of American muscle and performance. Available in a wide range of domestic and import applications for automobiles and trucks, Flowmaster® mufflers produce more power than Original Equipment (OE) and competitive aftermarket products. What makes Flowmaster@ so unique is our performance improvements are paired with our unique exhaust tones.The "Flowmaster@ Sound" is offered in many different tones depending upon the muffler series. From the deep, aggressive tone of the Super 44TM to the quiet and subtle Flowmaster tone of the 70 Series, you will find the right application for the performance and exhaust tone you want. Looking for the most aggressive sounding Flowmaster muffler available? Flowmaster’s new Super 10 Series mufflers are so aggressive that we can’t even recommend them for use on street driven vehicles. The Super Ten Series utilize the same patented Delta Flow performance technology used in our highly popular Super 40 and Super 44 Series mufflers. Best of all they are constructed with durable 409S Stainless Steel for long life and are offered in a variety of inlet/outlet configurations. Flowmaster’s NEW Super 44™ muffler with its 4” x 9.75” x 13” all black finish case offers distinct advantages over our original 40 Series™ muffler. Using the technology seen in our larger Super 40™ mufflers, the Super 44™ delivers a rich deep tone, an improved flow path radius, optimum internal flow and sound control, all created with Flowmaster’s Delta Flow® technology. It is the most aggressive, deepest sounding, highest performing four inch case street muffler we’ve ever built! The Super 40 is our latest development utilizing "Gen II Delta Flow" technology. This gets you the best of both worlds of Sound and Performance. The Super 40 has that "deep powerful" sound of the original 40 series but with all the benefits of performance and low interior resonance from the "Delta Flow technology." This two chamber design incorporates Flowmasters patented "Delta Flow" technology. The "Delta" deflectors result in increased scavenging for better performance and reduced interior resonance over the standard 40 series with a nice growl outside the vehicle. Sounds great on late model performance cars with catalytic converters. Constructed of 16 gauge aluminized steel and fully mig-welded for maximum durability. The 80 Series is designed for applications where the muffler must be mounted transversely (cross-flow) behind the rearend. It provides an aggressive muscle car sound both inside and outside the vehicle. A replacement for early and late model Camaros & Firebirds. Constructed of 16 gauge aluminized steel and fully mig-welded for maximum durability. Another addition to Flowmaster's product line is our 50 Series™ H.D. muffler. It is Designed primarily for today's higher horsepower trucks such as the Dodge HEMI. This muffler will perform well on various vehicles when a deeper, more aggressive tone is desired. This new muffler features a 4.00-inch internal design, which is ideal for trucks with modified engines. It is built from 16 gauge aluminized steel and comes with various inlet/outlet configurations. This is the latest design of the 50 series™ muffler that utilizes Flowmasters patented "Delta Flow" technology along with an Helmholtz Chamber to eliminate most all interior resonance and still have that famous Flowmaster sound outside the vehicle. Constructed of 16 gauge aluminized steel and fully mig-welded for maximum durability. The 60 Series incorporates Flowmasters patented "Delta Flow" technology to produce a nice mellow sound for your sport compact car & Truck. A larger diameter tailpipe will create a deeper tone both inside and outside the vehicle. Constructed of 16 gauge aluminized steel and fully mig-welded for maximum durability. A Sound Alternative from Flowmaster! The perfect choice for a variety of vehicle styles and engine applications, Flowmaster’s dBX® mufflers utilize cutting edge laminar flow technology drawn from both the HP2 and Pro Series muffler lines to provide maximum performance and deliver a sound quality like no other. The key to it’s superior performance and smooth refined tone is the patented core design, which delivers maximum exhaust efficiency, while at the same time minimizing the interior drone that is associated with other performance mufflers. The 50 series "Big Block" muffler is our largest muffler for tow vehicles, trucks, large Sport utilities and Recreational Vehicles. This muffler is made for more than just big cubic inch engine applications. It has a very large H-Chamber to reduce interior resonance in large cab areas of vehicles and enough case volume to handle engines under heavy loads. Constructed of 16 gauge aluminized steel and fully mig-welded for maximum durability. The 70 Series "Big Block II" uses a large case for increased volume and added sound reduction that will still fit many applications that our 50 series "Big Block/HD" muffler won't fit. It utilizes Flowmaster's patented "Delta Flow" technology for maximum efficiency and reduction of interior resonance. Use on high performance street cars, trucks, SUV's, RVs and tow vehicles. Constructed of 16 gauge aluminized steel and fully mig-welded for maximum durability. The Flowmaster® Outlaw® Series Race Mufflers are our smallest and lightest race mufflers to date. When attached directly to the collector, it generally produces more power than open headers, while taking the “edge” off that open header sound. 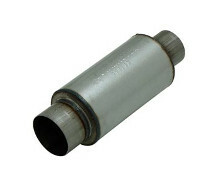 These race mufflers are designed to be used at race tracks requiring mufflers, but without dB restrictions. 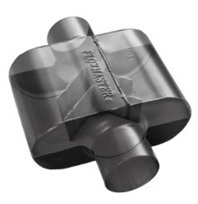 Available in two compact lengths and tubing diameter sizes including 3.00″, 3.50″, 4.00″ and 5.00″. Cat Back Exhaust Systems Kits redesigned for the person who wants that custom look of a dual exhaust on a late model vehicle that came with a factory single exhaust. These systems feature mandrel bent 16 gauge aluminized steel tubing, either weld-on or flanged inlet pipe/pipes, specially tuned muffler, clamps, hangers and stainless steel exhaust tips for that aggressive look and sound of a dual exhaust system.